It’s only December 1, but it’s already time to run back one of the NBA’s annual questions: How the hell are the Bulls doing this? They have already played a handful of games without Derrick Rose, Joakim Noah, and Taj Gibson, and it hasn’t really mattered. They have played a league-high 12 road games, and they’ve come through that stretch at 9-3. Jimmy Butler has exploded out of the gate looking like an All-Star, and when the Bulls have all five starters healthy, they’re 5-0. Meanwhile, Pau Gasol is playing like it’s 2010, Nikola Mirotic has looked like a real weapon off the bench, and Aaron Brooks is the latest in an endless collection of backup point guards who come to Chicago and fill the D.J. Augustin Career Revival Role. 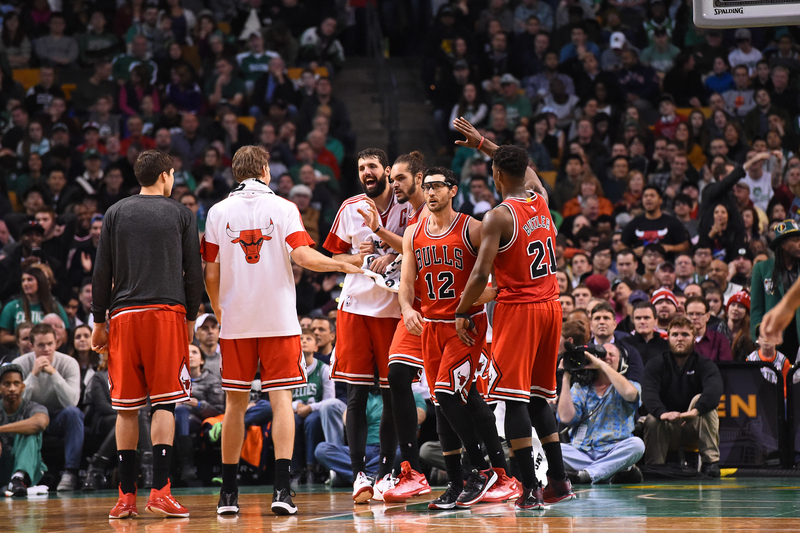 Kirk Hinrich is still there, too, because Kirk Hinrich is always there. Kirk Hinrich will be with the Bulls forever, like luggage. It’s always tough to contextualize the Bulls next to every other contender. They don’t have the traditional superstars of a powerhouse, they don’t spend a ton of money, they don’t run teams off the court with offense, and, more often than not, the most dominant personality is their coach. The best way to understand the Bulls is to think of them as the closest thing the NBA has to an NFL team. Thibs treats every regular-season game like the season is 16 games long, not 82. Players are asked to play too many minutes even when it means jeopardizing their health, and guys like Gibson are asked to put the team before their ego, even when it means jeopardizing bargaining power. When the offseason comes, the front office is generally reluctant to overpay players and sometimes even Thibs himself, regardless of the stupid amount of money this team makes every year. While other big-market teams — the Nets, Knicks, Lakers, even the Heat — spend big to add stars, the Bulls generally buy low, maximize their draft picks, and then sell before it’s too late.1 In Chicago, the NBA may as well have had the same hard cap as the NFL. And it hasn’t mattered, because the Bulls keep winning. There are criticisms and compliments baked into all of that, but the dominant theme is consistency. The winning just keeps going. Look at the Bulls’ game against the Nets on Sunday. Those teams haven’t really been that different over the past few years. Both have had rosters built around an injury-prone point guard (Deron Williams, Rose), with a big man as the second star (Brook Lopez, Noah), and a couple of aging wings (Paul Pierce and Joe Johnson, Luol Deng and Mike Dunleavy). The Bulls have had always slight advantages across the board, but we’re really seeing the difference this year. If Chicago had stuck with Deng and Boozer, or traded for another high-priced veteran, the roster would probably be just as lifeless as what Brooklyn has. It’d be like mirror images of the same NBA cautionary tale. Instead, while Brooklyn has spent ungodly amounts of money going over the cap to build a contender with bigger names, Chicago took the opposite approach. As players like Deng and Boozer have aged and sputtered out, the Bulls flipped them for cheaper replacements like Gasol, Gibson, and Butler. They won by 18 in Brooklyn this weekend. All of this would be a bigger story if it weren’t so completely predictable. This column gets written every year. The same way you could count on the Ravens and Steelers defenses for the better part of the past 10 years, you can always count on Thibs’s Bulls. But I’m pretty sure there’s a new wrinkle this season. It may look like Thibs & Co. are churning out the same overachieving season we’ve taken for granted the past few years, but that also downplays how good they’ve looked. While most of the East wheezes its way to Christmas, the Bulls haven’t even been healthy and they still look more rock solid than anyone. Losing out on Carmelo Anthony was supposed to put a ceiling on what this team could do, but there’s more hope now. I doubted Gasol from the day he signed in Chicago, but he’s been fantastic as a scorer and a passer next to Noah, and with Gasol in the mix, the team is moving the ball better than ever. For the first time in forever under Thibs, the offense is almost as impressive as the defense. Most importantly: Jimmy Butler. He’s the talent at the center that makes all the other usual role players twice as dangerous. Danny Chau wrote about Butler in last week’s Shootaround, but it bears repeating. He’s averaging 21.9 points per game, shooting nearly 50 percent, and adding 5.7 rebounds and 3.1 assists to go with defense that was always his calling card. Nobody was prepared for Thibs to have this Jimmy Butler. It’s like watching a poker player pull an ace out of thin air. The first month of this season has been clouded by the endless melodrama over Rose, and that’ll probably continue for most of the year. But that distracts from the bigger story with Chicago. The team that ran out of scoring in last year’s playoffs now has more firepower among the starters and off the bench. The team that could never really score is averaging 100 points per game. The team that was supposed to live and die with Rose’s knees now has Butler, who’s giving the Bulls most of what everyone hoped Carmelo might have given them. It’s a “next man up” kind of league, Thibs once said. That’s actually not true at all. The NBA isn’t the NFL, and when stars go down, teams like the Thunder and Pacers free-fall to the bottom. I want to make fun of anyone who uses the “next man up” religion to explain the Bulls, and I want to make fun of the fans who buy into it every year, but I don’t even know anymore. Can you blame them? Where did Jimmy Butler come from? How do you explain Taj Gibson the last few seasons? There are still plenty of questions, obviously, the biggest being whether guys like Gasol, Noah, and Butler will be able to stay healthy enough to keep this going in the playoffs. “Will Thibs run this team into the ground?” is as familiar a talking point as “How do the Bulls keep doing this?” That’s the other side of the football coin. Likewise, the better Butler looks, the worse the Bulls look for lowballing him in contract talks this fall, and the easier it is to imagine him moving on this summer. And Rose is the eternal question mark, because having him healthy transforms Chicago from one of the three or four best teams in the East to the clear favorite. But none of the questions makes it any less amazing that the Bulls keep coming up with answers. No matter who they lose, what free agents they don’t sign, or who’s hurt, the Bulls are always good enough to compete with anyone. This year, they might be even better. Technically two years too late with Boozer, but still. He’s gone now. See also: SPURS, SAN ANTONIO.